Happy Birthday Julia!! On August 15th, Julia Child would have been 100 years old. Sadly, she left this world several years ago, but she left behind a legacy that has inspired both professional chefs and novice cooks, alike. I remember watching Julia’s shows on PBS on my grandma’s 12-inch television when I was just a small child, pretending the perfume bottles and knick knacks that were scattered on her dresser were my bottles of ingredients as I “cooked” in her bedroom. That is why I am so excited that #SundaySupper is joining with PBS celebrate this event as we help them kick off the celebration during the week leading up to her birthday, as foodies around the world unite to #CookForJulia! Julia was wise and smart, and not just in the kitchen. I wish her words above had rung in my ears at an earlier age. While I am happy I found my passion for food, I wish I had discovered it sooner. Or perhaps I had discovered it, as evidenced by my story above, but maybe I just didn’t accept it, and instead went with the more traditional route for your typical, geeky “smart girl” – 4 years of college followed by starting a career in my chosen field. Well, maybe one day I will get to culinary school. But for now, I am just going to keep interested in this passion (as well as my newer one – food photography) and indulge it by sharing with all of my wonderful readers, and learning from all of my incredible foodie friends. When deciding what to make for #SundaySupper, I went to Facebook and asked my fans what I should make. I got a lot of great suggestions, but one thing jumped out at me – Ratatouille! I knew that I would be getting pretty much every ingredient from my CSA share, so it was the perfect recipe to be able to use the freshest ingredients for this time of year. It felt good to know that I was preparing this recipe truly in her spirit, by using what was local and in season. I am not going to say that this was a quick recipe, but it is not difficult. And is is easily made in advance, so if you have some time and find peeling and cutting and sautéing as therapeutic as I do, then give this recipe a try. I made it the night before, and since my tomatoes didn’t seem super-juicy, and we tend to like our veggies fairly soft, I added about a quarter cup of water. Totally not necessary. By the time I pulled to pot out of the fridge the next day to reheat it, a ton of juices had been given off. So I had to boil it down a little. But this was OK to me, since, as I said, we do like softer veggies. For so few ingredients, I could not believe how flavorful the ratatouille was. I guess that is what she was trying to say – fresh, local, in-season ingredients are all you need to make good food. While channeling my own inner-Julia, I also made her roast chicken and a mini version of Pommes Anna, which I hope to share with you as we continue to celebrate in the days leading up to her birthday. Samantha of The Little Ferraro Kitchen has done a fabulous job planning and hosting this week’s event, and at the bottom of this post, you will see the links to all of the #SundaySupper #CookWithJulia participants and the amazing recipes they have selected and recreated. And remember, the fun starts every week at 3:00pm ET by showcasing fabulous recipes. At 7:00 pm ET, we will start our live chat. Join us on twitter by using hashtag #SundaySupper or using Tweetchat. We love to feature your recipes on our #sundaysupper pinterest board and share them with all of our followers. In addition, PBS Food and #JC100 will be tweeting with us and kicking off her 100th Birthday celebrations. See you there! I hope that you are inspired to cook something wonderful for your family and friends, and, more importantly, to follow your passion!! Do you have a favorite Julia Child recipe? Slice an "X" in the bottom of each tomato. Place the tomatoes in the boiling water for 30 seconds to 1 minute, or until skin starts to separate from the tomato. Allow to cool slightly, then remove the skin. Slice the tomatoes in half, remove seeds and juice, and slice into 3/8-inch strips. Peel eggplant, and cut into slices about 3/8 in. thick, 2-3 in. long, and 1 in. wide. Slice off the ends of the zucchini, and cut into slices about the same size as the eggplant (I quartered the zucchini lengthwise, then cut 2-3 in. long). Toss the vegetables in a bowl with the salt, and let stand for 30 minutes. Drain and dry on a towel. Heat about 1T olive oil at a time in a 10- to 12-in enamel skillet or pot. In a single layer, saute the eggplant for about 1 minute per side, followed by the zucchini, until lightly browned, adding more olive oil, as needed. Set aside in a bowl. 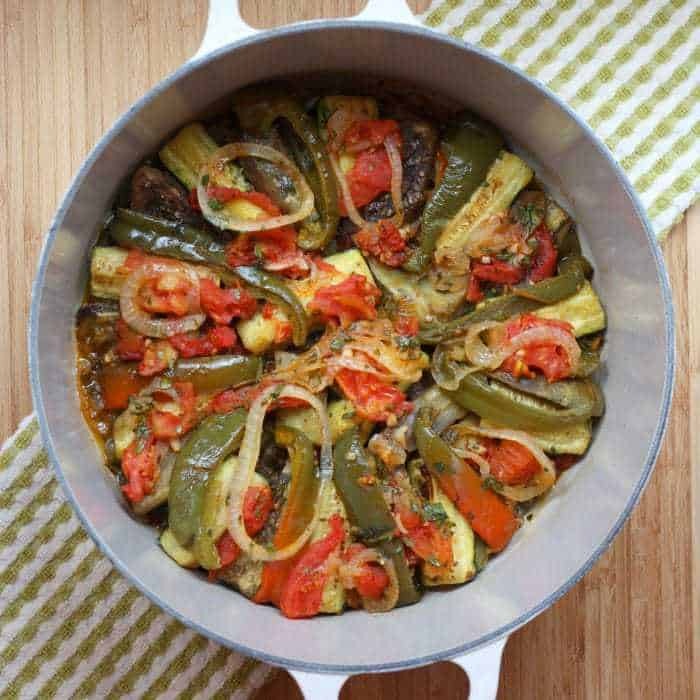 In the same skillet as the eggplant and zucchini, cook the onions and peppers slowly in olive oil for about 10 minutes, or until tender but not browned. Add garlic, and salt and pepper, to taste. Lay the reserved tomato slices over the onions and pepper. Season with salt and pepper. Cover and cook on low for about 5 minutes, or until tomatoes begin to release their juices. Uncover, baste tomatoes with juices, increase heat, and boil until most of the juice has evaporated. Place one-third of tomato mixture into an enameled pot or other casserole that can go on the stovetop. Sprinkle with 1 T parsley. Arrange half of the eggplant and zucchini on top, then half of the remaining tomato mixture, and another 1 T parsley. Arrange the rest of the eggplant and zucchini, then the remaining tomatoes and parsley. Cover and simmer over low heat for 10 minutes (See Notes). Uncover, baste with juices, and adjust seasoning. Increase heat slightly, and cook uncovered for about 15 minutes, basting occasionally, until juices have almost completely evaporated. 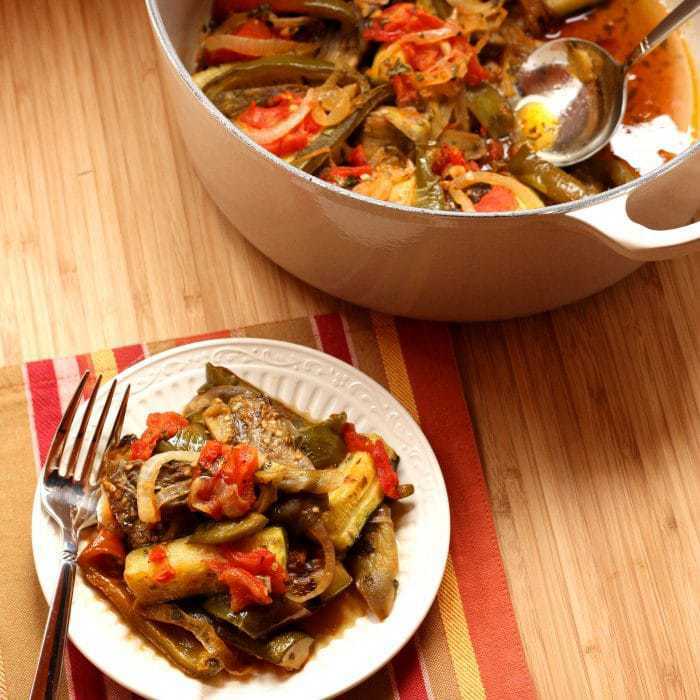 This dish can be cooked one or more days in advance. If you are serving right away and/or you prefer your veggies a little softer, you may have to add a touch of water and cook a but longer. If you are going to refrigerate and reheat the next day, the veggies will give off more liquid as they sit. Join us this week Around the Family Table for #SundaySupper! That fun starts at 3pm EST with these fabulous recipes being showcased and ends with our #SundaySupper live chat at 7pm EST. 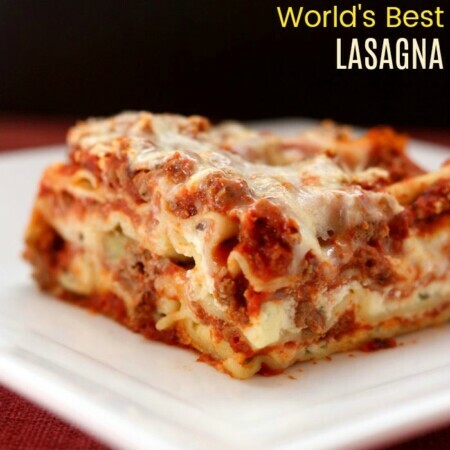 This is a #SundaySupper you don’t want to miss! Provencal Tomato Quiche by Are you hungry? Oeufs à la Diable by What Smells So Good? This is so seasonal, and you’ve arranged it so beautifully in the pot, almost like a kaleidoscope pattern. Of course I’ve heard of salting eggplant to get the bitterness out (though it’s really only the big eggplants that need that) but it’s interesting that she calls for salting the zucchini and eggplant together. I’ll think of this one next time my husband brings home eggplant from the farmer’s market. Sorry for the super-late reply. Blog went on hold unexpectedly for awhile! Thanks! Yes, I am not sure that salting the zucchini is really necessary, but on my first attempt, I wasn’t going to contradict Julia! Thats way too much work for Ratatouille. All you need to do is cut up into large bite sized pieces the vegetables, then pour some salt and olive oil over them, toss, then place in oven. All the other preparations like cutting the skin off tomatoes and soaking the eggplant in salt is uneccesarry and can’t imagine it fundamentally changes the flavor. I love this Ratatouille! 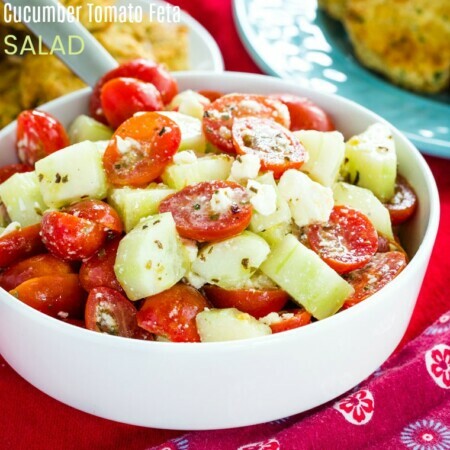 There’s so many great vegetables in this dish! Yum! 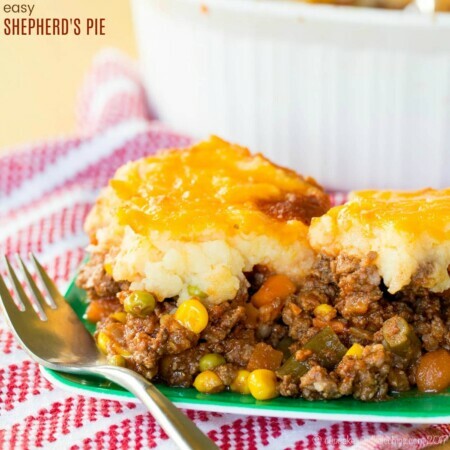 I love the way you layered the dish in the pot – the photos are just great!! 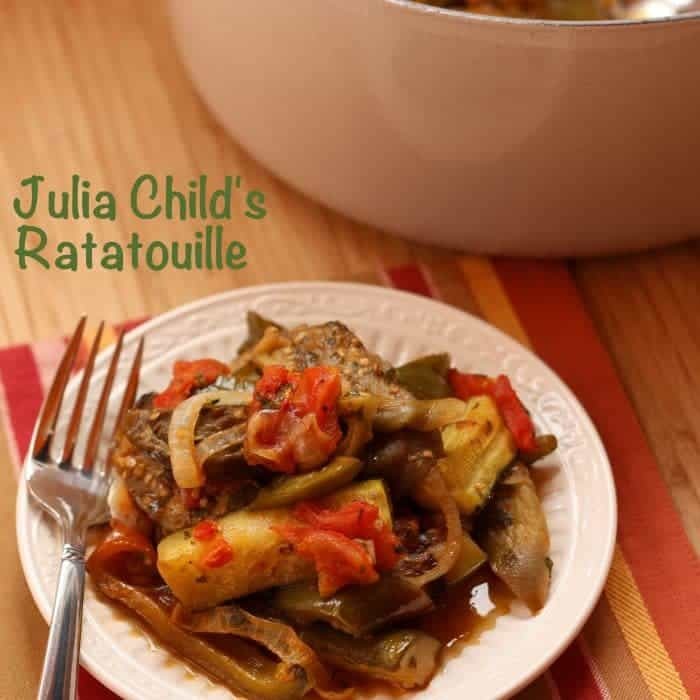 And ratatouille is a wonderful summer dish – great choice!! Your arrangement is so pretty! Love all of the colors. I’ve been meaning to make Ratatouille ever since the movie Ratatouille came out but never took the plunge. You’ve given me inspiration. I’ve added Ratatouille to my “soon to make list”. Thanks for sharing. This looks like perfection to me. 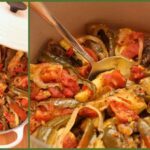 I am in love with this recipe and your photos. Great SS recipe. Love it. 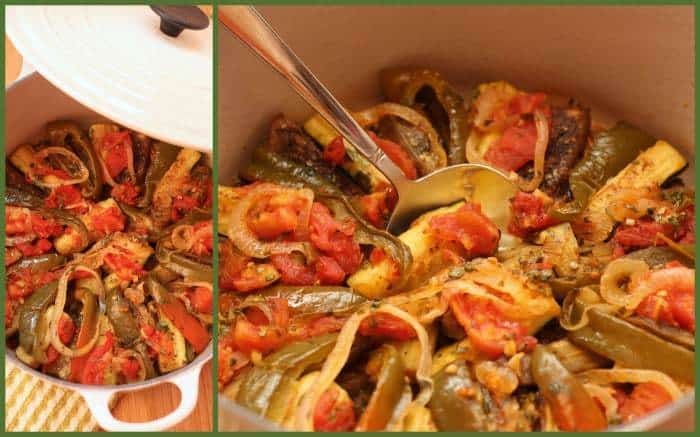 What an amazing ratatouille! Perfect with all the wonderful summer produce we have now! Gorgeous! I love the idea of serving it with chicken! This looks so good, I can almost taste it! 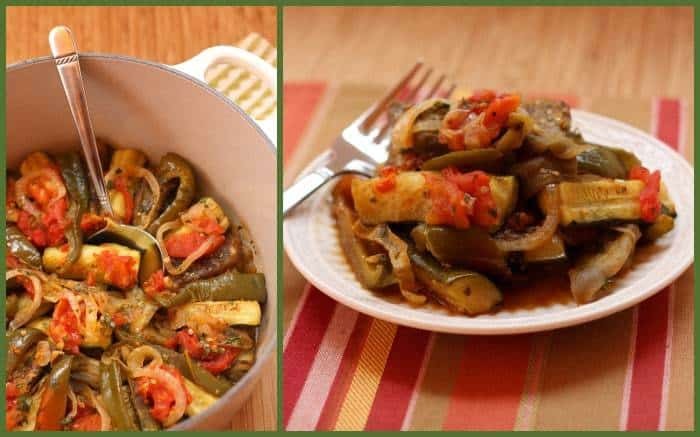 I love ratatouille and this looks like such a good recipe! Oops so sorry Brianne! I saw Samantha’s name above and typed in ‘Samantha’! For some reason, I thought ratatouille was a mish mosh stew. I was wrong. This looks great! And I’m sure it tasted pretty incredible! Thank you for sharing Samantha! This dish brings such great memories, it was one of the first ones my grandmother taught me to do. 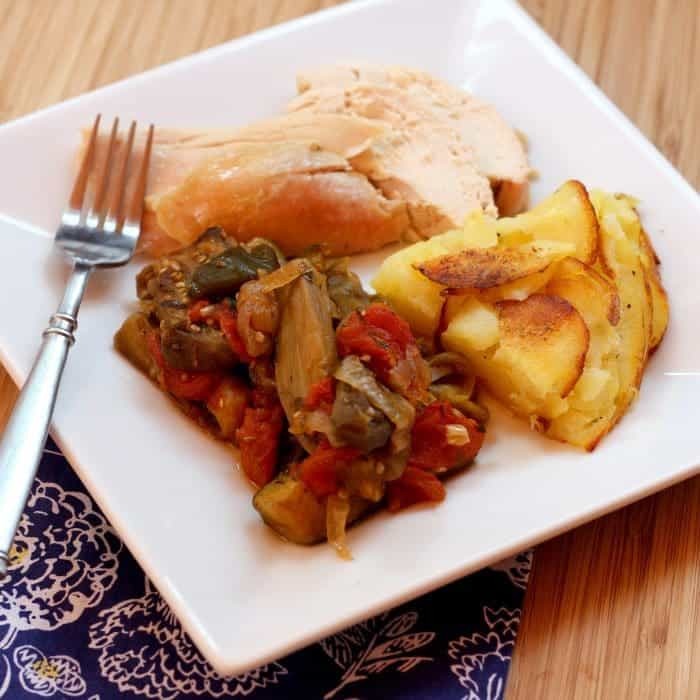 I love ratatouille, and your final plate is perfect with the chicken and potatoes. Have a great week Brianne! So many delicious veggies! Wow I think I could just eat a big plate of this for dinner. My mom and I love ratatouille and we have almost everything growing in the garden to make it! Oh my gosh – YUM! I was SO looking forward to seeing this dish…and it does not disappoint. I would love a big helping – the whole plate full of food looks fantastic! This looks incredible! As always, your photos are gorgeous! 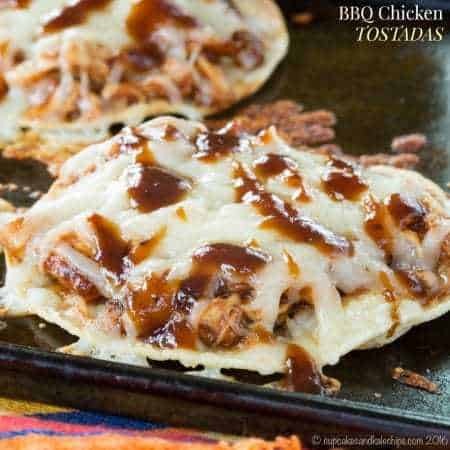 This dish is literally one on my foodie bucket list. I have no excuse now, because this looks delicious!